When I have finished business, I go to find myself in God. 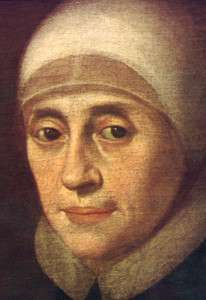 Mary Ward prayed constantly for the freedom to ‘refer all to God’, finding the joy of God’s presence in prayerful silence, in work, in the companionship of her friends, in her triumphs and sorrows. An early biography describes how one of her faithful companions said of Mary Ward: The name Jesus was her first and last word, the beginning and ending of all her prayers, her refuge in all dangers and her protection from all evil. There is no such difference between men and women that women may not do great things. I hope in God it will be seen that women in time will do much. Women should and can provide something more than ordinary. God will assist and help you, it is no matter the who but the what I had no other desire than to give myself over in all these difficulties and place myself with these uncertainties into the hands of God. Take me, take all that I am, and let me still see what I am without you. Your will be always done in me. Abiding with him, listening to him, or else presenting my concerns. Leaving myself, and all, in him and his will. I saw there was no other help and no other comfort for me than to go close to Him. That I did, and He was there to help me. I will find in God, whatever consoles me and gladdens me, and hasten to him for help, in all sufferings and necessities. What disturbs me inwardly and makes me troubled does not come from God, for the spirit of God always brings with it freedom and great peace. Something happened also, discovering the freedom that such a soul should have to refer all to God. I will do these things with love and freedom or leave them alone. We were bound to give our lives for our neighbours’ souls, and our goods for their lives, and not our superfluities, but what may touch us.Be seekers of truth and doers of justiceTo love the poor, persevere in the same, live, die and rise with them was all the aim of Mary Ward. A person should not be half-hearted in giving herself to God but whole and entire. You, O Lord know my heart! Make this heart complete as you would have it be. Show yourself as you are, and be what you appear. How happy a thing it is to love God and serve Him and seek Him in truth Love and speak the truth at all times. This is verity; to do what we have to do well. Still look sad? Come let us rather sing and praise God joyfully for all his loving kindness. Show yourself at all times glad and joyful, for Almighty God loves a cheerful giver. If anyone gives you trouble, meet him with friendly words, for so you will soften both yourself and him. For further prayer resources please click here.